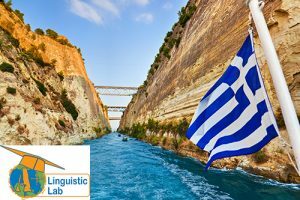 Come and join “The Linguistic Lab” on an educational culture vacation in Greece. 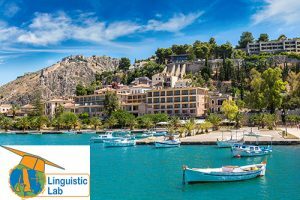 Our program takes place in the villages on the “Northern Coast of Peloponnese“.These pleasant villages are situated one after another along the beach in front of some beautiful mountain ranges on either side of the Corinthian Gulf. What a combination – the sea, the sun and the mountains! 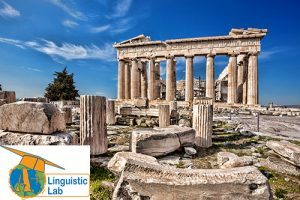 Your Homestay Families and our central office are centrally located, near some of the most impressive ancient historical sites in all of Greece. We are only 75 miles south of Athens, home of the world famous Acropolis and Parthenon. Acrocorinthos, the fortress of Archaic, Classical and medieval times, is only 25 miles away. Delphi, considered to be the center of the world in ancient times and home of the famous Oracle of Delphi, is only 60 miles from us. Kalavrita, (40 miles) where the uprising against the 400 year Turkish rule started as well as Mycenae (45 miles) whose mythological founder was Perseus, son of Zeus and Danae, are even nearer. The most famous for its acoustics and well preserved ancient theater in Greece, Epidaurus, is only 55 miles away, while Nemea, where Panhellenic Games were held every 2 years, is 45 miles away. Nafplion, mythologically founded by Nafplios, son of Poseidon, who took part in the Argonaut Campaign, is 45 miles away too. Ancient Olympia, where the Olympic Spirit was born so long ago, is 125 miles away. With such beauty and glory surrounding the area, is it any wonder why the people here believe they live in Paradise? Last summer we hosted groups from Arizona, Nebraska, New Jersey, Ohio, Florida, New York and California. They were in tears when they were distanced from their Host Families and Greece. Share in this beautiful summer experience with us during this summer.